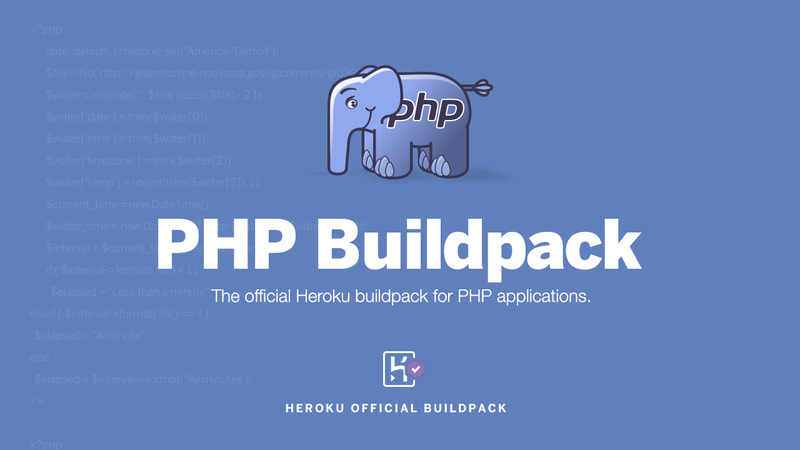 This is the official Heroku buildpack for PHP applications. It uses Composer for dependency management, supports PHP or HHVM (experimental) as runtimes, and offers a choice of Apache2 or Nginx web servers. You'll need to use at least an empty composer.json in your application. $ git commit -m "add composer.json for PHP app detection"
Please refer to Dev Center for further usage instructions. The buildpack uses Composer repositories to resolve platform (php, hhvm, ext-something, ...) dependencies. To allow the use of multiple custom repositories, the config var may hold a list of multiple repository URLs, separated by a space character, in ascending order of precedence. If the first entry in the list is "-" instead of a URL, the default platform repository is disabled entirely. This can be useful when testing development repositories, or to forcefully prevent the use of unwanted packages from the default platform repository. For instructions on how to build custom platform packages (and a repository to hold them), please refer to the instructions further below. Please note that Heroku cannot provide support for issues related to custom platform repositories and packages. The following information only applies if you're forking and hacking on this buildpack for your own purposes. Please submit all pull requests against develop as the base branch. Please refer to the README in support/build/ for instructions.